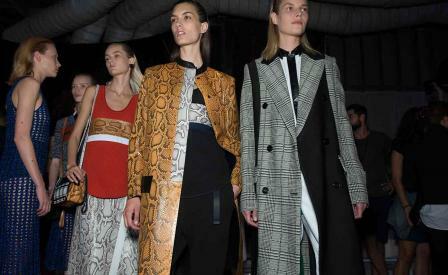 A fashion show by Proenza Schouler is almost always good and, at times, truly great. Designers Jack McCollough and Lazaro Hernandez can't be expected to hit it out of the park every season, but for spring they did just that with a collection that centred on their signature surface interest and sizzled with the frisson of the new. Working with paper-thin leathers that draped with the ease of organza or woven strips of silk that spilled into piles of unfinished fringe, the designers graduated from a proficiency in craft to a mastery of craftsmanship. The expertise required for intricately braided intarsia slithering their way through leather, or python patched up with Prince of Wales check and wool, or leather crochets falling like open-weave netting, is not insubstantial. These complex, sophisticated techniques - plus many more - were blanketed across nearly every look in the collection, without ever getting tricksy or heavy handed. Rumours are swirling that luxury behemoth LVMH has its eye on this New York based brand; if that's the case this collection was another gold star on their already shiny resume.